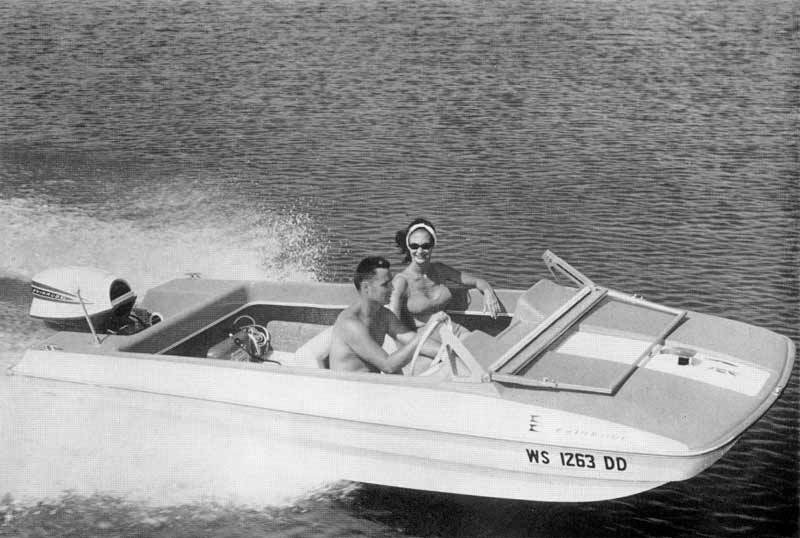 The unique, award-winning style of the original 1964 - 1965 Evinrude boat line was directly attributed to long-time, Milwaukee-based, industrial design consultant, Brooks Stevens. Mr. Stevens (1911 - 1995) had a long and successful industrial design relationship with Evinrude, dating back to 1936. Between 1956 and 1962, Stevens designed seven imaginative "concept" or "dreamboats" (often called "shriekers" because they shouted "look at me!" at annual national boat shows) boats for Evinrude. The most famous of these designs was the patented, tall-tail-finned, 1956 Evinrude "Lark," runabout featured on the cover of Newsweek magazine. A year later, this trend-setting boat design entered production as the Cadillac Sea Lark. View original brochure here. When Evinrude entered into production of fiberglass boats in 1964, it utilized the patented gull-wing hull design of marine architect, Richard Cole. But the colors, unique windshields, interiors, helms and top deck design details (from the gunwales-up) were the work of Brooks Stevens, FIDSA. To learn more, view the Brooks Stevens Milwaukee Art Museum online exhibition. This glass fiber motorboat has a gull wing hull configuration with molded sponsons and a blunt nose for stability and a smooth ride. The blunt nose also serves to keep water spray from coming over the bow. An innovation is the fold-down window shield ( a hook behind the running light anchors the window down) which has an extruded aluminum frame that doubles as an air-vent along the bottom edge. This is a good detail in southern climes where boat riding can be very hot. The deck has a slip-resistant pebble grain pattern. The boat, which comes in Gray with Red accents or Blue with Blue accents, has smoothly molded lines. The absence of chrome strips, flashy crests or outlandishly shaped fittings puts this design in a rare class.